20 - Ludington Area Center for the Arts, (231) 845-2787. 3 - Todd & Brad Reed Photo Gallery, (231) 843-0777. 5 - Lake Michigan Carferry, (231) 843-0508. 6 - Lie-a-Lot Charters, (800) 850-1978. 10 - Brenda's Harbor Cafe, (231) 845-7434. 32 - Chef John's Bakery & Cafe, (231) 843-3327. 41 - House of Flavors, (231) 845-5785. 12 - Jamesport Brewing Company, (231) 845-2522. 4 - KRAVE Frozen Yogurt & Candy Shoppe, (231) 425-8787. 13 - Luciano's Ristoranti, (231) 843-2244. 14 - Old Hamlin Restaurant, (231) 843-4251. 15 - PM Steamers, (231) 843-9555. 43 - Sportsman's Restaurant & Irish Pub, (231) 843-2138. 36 - Sunset Side Concessions. 14 - Table 14, (231) 843-6555. 48 - The Q Smokehouse, (231) 425-3933. 27 - Energetic Bodywork by Judith, (231) 510-5800. 9 - Ludington Holistic Health, (231) 425-4673. 16 - Pierrot Hair Design, (231) 845-6068. 19 - Blue Spruce Inn, (231) 843-9537. 25 - By the Lake at Lighthouse Motel, (231) 843-3333. 29 - By the Lake at Parkview Cottages, (231) 843-4445. 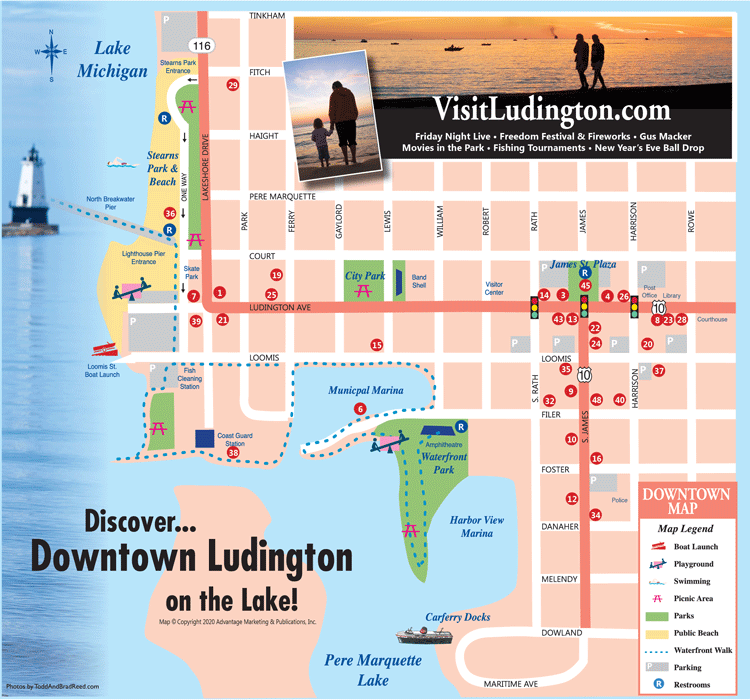 21 - Ludington Pier House Motel, (231) 845-7346. 18 - Nader's Motor Lodge, (231) 843-8757. 39 - Snyder's Shoreline Inn, (231) 845-1261. 23 - Stearns Motor Inn, (231) 843-3407. 45 - All Occasions Events & Floral, (231) 233-3455. 40 - Love 4 Paws, (231) 425-4644. 28 - Lighthouse Group, (231) 845-6946. 37 - Ludington Taxi, (231) 845-9693. 40 - Tailor Shop, (231) 425-4256. 34 - AJ's Party Port, (231) 845-5510. 3 - Cedar Chest Consignment Shoppe, (231) 845-7974. 3 - Gordy's Skate Co., (231) 845-9100. 24 - Instrumental Music & Sound, (231) 843-4411. 8 - Lakeshore Coins & Expressions Jewelry, (231) 425-4180. 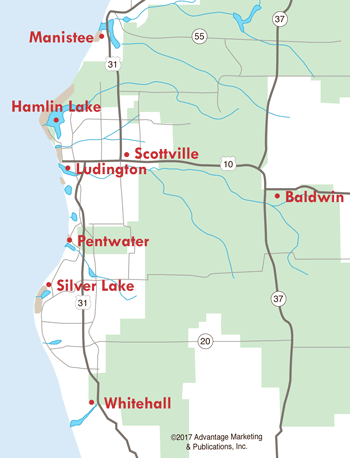 7 - Ludington Jaycees Mini Golf, (231) 843-4663. 3 - Provisions Sport Shop, (231) 843-4150. 22 - The Windowsill Used & New Books, (231) 425-3421. 35 - ThomasO Jewelry Designs, (231) 425-9300. 26 - Sandcastles Children's Museum , (231) 233-9326. 38 - Port of Ludington Maritime Museum, (231) 425-9090.